Born and raised in Kathmandu, Bodhi Garrett graduated from University of California Berkeley and moved to southern Thailand in 2003; researching sea turtles and serving as marketing and conservation director for a remote eco-resort. Bodhi founded North Andaman Tsunami Relief after the December 2004 wave claimed his job, home, and the communities he had come to know and love. The grassroots disaster relief effort grew under his leadership to encompass over 150 projects in 12 villages. Since 2007, Bodhi has guided the formation of a number of award-winning groups, including a handicrafts cooperative, Youth In Action conservation projects, the North Andaman Community Tourism a community network, and, of course, Andaman Discoveries. Bodhi’s recent speaking engagements on sustainable tourism and community development include Cambridge University’s Education Without Borders, the Global Ecotourism Conference, and the Asian Institute of Technology. 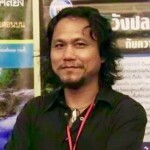 Long time conservationist and nature advocate, Mr. Somsak Soonthornnawaphat, joins the NAN board bringing with him over thirty years of experience working with Thailand’s natural resources. 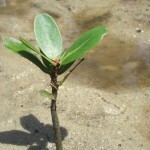 Most recently, Somsak, had led the conservation efforts to save the endemic Thai water lily found only along the North Andaman Coast in the provinces of Phang Nga and Ranong. This campaign has combined local governments with individuals to create one of the most popular conservation projects in recent history in this area. His previous work within the fields of natural resource management and conservation, management of integrated costal zone and river ecosystem, as well as rural community development and sustainable agriculture offers the NAN communities a wealth of information. Somsak’s guidance and efforts are well known and appreciated by all who enage with him. With a clever wit, and an unfailing sense of social justice, Nat’s responsibilities include project management, administration, community relations, and graphic design. She serves as the coordinator for the North Andaman Community Tourism Network, and for our local youth environmental education collective. Nat’s willingness to help with whatever is needed, and her deep friendships in the communities we serve, make her a very important part of the NAN team. Nat’s professional experience includes time with the Elephant Conservation Network, the geoinformatics journal of the Asian Institute of Technology, and a number of other positions at NGOs. Nat’s education includes a Bachelor’s degree in biology, one in Thai studies, and a Master’s degree in Oriental Language Inscription. Nat’s hobbies include traveling, with recent trips to Japan and Germany. Just before the tsunami, Tui was due to start to work at a resort on Koh Phra Thong. Fortunately, she had to return to Bangkok on that fateful day to collect some documents and remained safe while the resort was completely destroyed by the wave. Tui decided to return to the region and work for the North Andaman Tsunami Relief (now Andaman Discoveries) to help rebuild the region. There is nothing that Tui does not do and you’ll find her in the office and in village, coordinating numerous community-led development projects, overseeing the long-term scholarship program (with over 126 students) and translating for tourists so that they can really engage with the villagers. Her personable nature makes her popular with staff, villagers and tourists alike. With a history in hotel and tourism management, Tui’s strong service mind and beautiful smile has been invaluable to the success of Andaman Discoveries. Aey is an avid marine conservationist who came to the North Andaman Coast in to work for the International Union for Conservation of Nature’s project in Kuraburi. Aey’s love of diving has made her a coral reef specialist with extensive knowledge and training in reefs conservation and monitoring. Her past experience includes project coordination for Green Fins Thailand, coral reef database design consultant for START Southeast Asia and project coordinator for UNOPS. Aey’s warm personality is always welcomed in the communities and helps to encourage participation and teamwork. After three years of committed work with Andaman Discoveries, Nicole transitioned to the NAN foundation to help coordinate project development and donor relations. 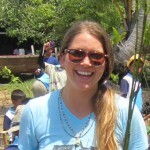 Her experience in Thailand began in 2010 when she arrived with the US Peace Corps as a community based development volunteer, and has continue with a focus on local life and sustainability. 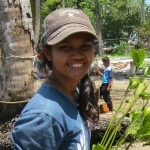 A love of nature, culture and language keeps her engaged and interested in the sustainability work of NAN. Nicole especially enjoys being out in nature, visiting with communities and experiencing the diversity of life on this planet. 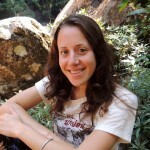 Lindsey works with Andaman Discoveries as Volunteer Coordinator. She served as a community development volunteer with the U.S. Peace Corps for 27 months in a small village in Prachuab Khiri Khan. This created the opportunity for her to learn the Thai language, understand the culture and truly appreciate how special Thailand is as a country. She believes that sustainable development and tourism are important in preserving the environment and culture found along the Andaman Coast. 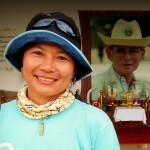 She loves interacting with the villagers, and participating in the many activities that they graciously share with guests, as well as the spectacular and unique natural environment in Thailand that is something to be cherished. Noon was born in Bangkok and raised in Surin Province in North Eastern Thailand, where the culture as well as the nature and environment are very different from Southern Thailand. She was very interested to learn about the way of life on the North Andaman Coast and took an internship with Andaman Discoveries for a semester before graduating with a B.A. in Tourism Management from Silpakorn University and then becoming a full-time staff member. Noon is a village translator and guide as well as helping with community relations and social media. Her degree is focused on environmental management for sustainable tourism and community base tourism and she looks forward to using her skills to help with the ongoing success of Andaman Discoveries. She really enjoys the very beautiful beaches, making new friend and trying all the traditional Southern food in the communities! Mondop Sreshthabutra, nicknamed Bee is know by everybody as “Pi Bee”. He was born in Bangkok and moved to live in Kuraburi more than 10 years ago, in the middle of the tsunami year. He graduated from Ramkhamhaeng University in the Political Science program. Before he came to work with Andaman Discoveries, he worked work with Golden Buddha Beach Resort on Koh Phrathong. Bee’s role at AD has him booking the details of each trip directly with the communities and translating for guests. He is developing great relationships with the villagers and will be working more in community relations.